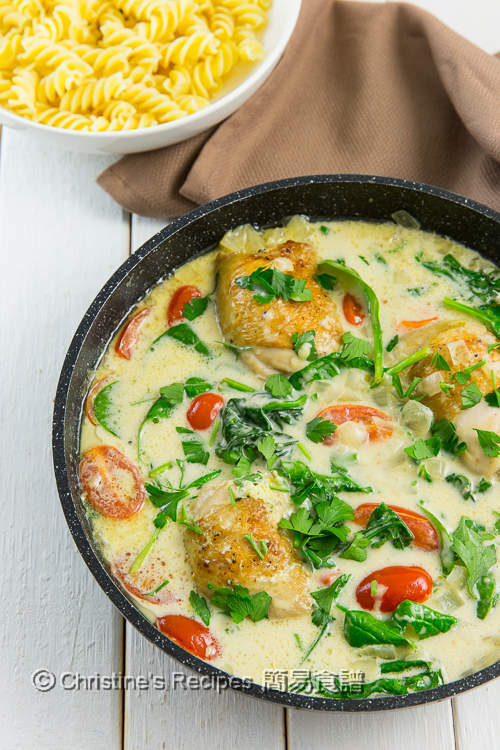 It’s my take on creamy garlic chicken thighs. The chicken meat is tender and moist. The sauce is creamy and tasty. It goes perfectly with a bowl of pasta. 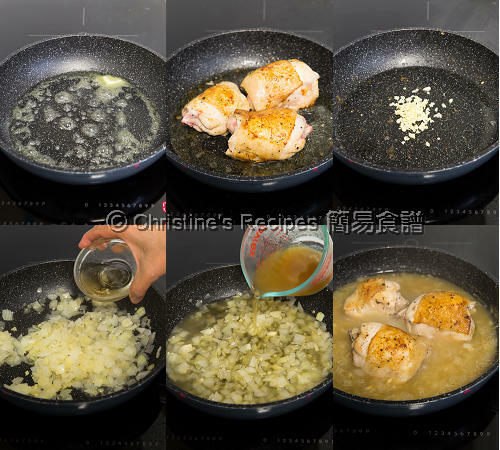 There’re many different cooking ways of chicken thighs that we can try with. That's the one of the reasons I’d like to cook chicken thighs. I’ll definitely buy some back home if the price is down. You won’t be wrong in any way when cooking chicken thighs except leaving them unattended and get them burnt. The ingredients used are fresh, no particular seasonings needed, except salt and pepper. 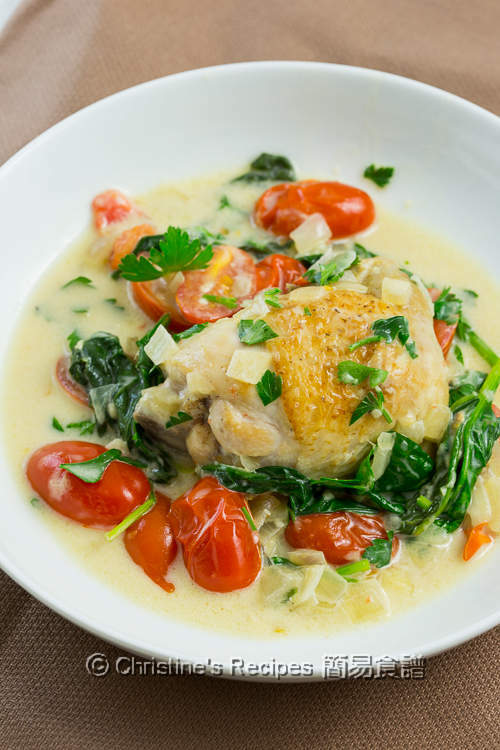 Simply cook the chicken thighs with cherry tomatoes and spinach in the sauce. You only need one pan to make this dish. Pan-fry the chicken thighs. Then off you go and make the sauce. 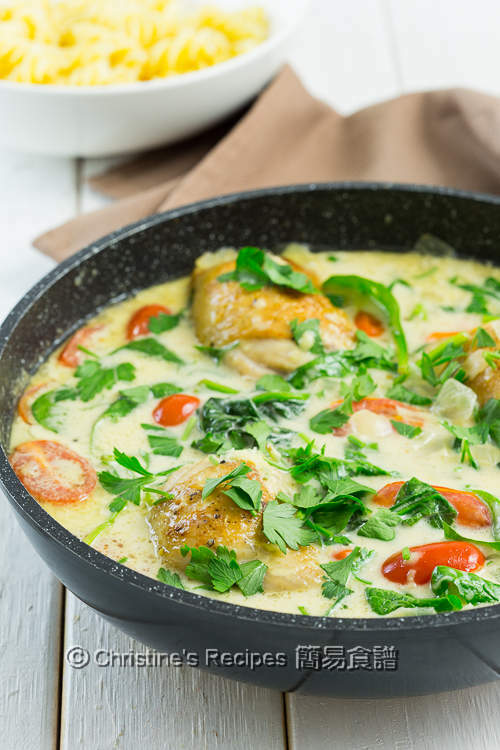 The garlic creamy sauce will make the chicken meat taste even more tempting. By adding some Parmesan cheese while making the sauce, the texture becomes very smooth and creamy, and a depth of flavours is created. Rinse the chicken thighs. Wipe dry with kitchen papers. Season with salt and pepper on both sides. In a fry pan, heat olive oil and butter over medium high heat. Pan-fry the chicken thighs, skin side first, until golden brown. Turn to the other side. You don’t need to cook through the chicken thighs at this stage. Set aside. Discard the excess oil in the pan, leaving about 1 tablespoon of oil in pan. Saute garlic. Add onion and cook until softened. Pour in white wine. Cook until reduced by half. Pour in chicken stock. Toss in the chicken thighs. Cook until the stock is reduced by half. 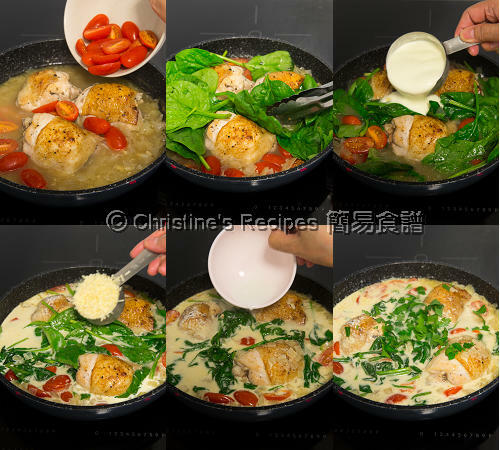 Stir in cherry tomatoes, half of the baby spinach, cream and cheese. Combine cornflour (corn starch) well. Pour the mixture in a steady stream and stir the stock at the same time. Test the taste. Season with salt if needed. Add the remaining spinach. Sprinkle parsley for garnish. Serve hot. This dish goes well with pasta, spaghetti or salad. Enjoy! 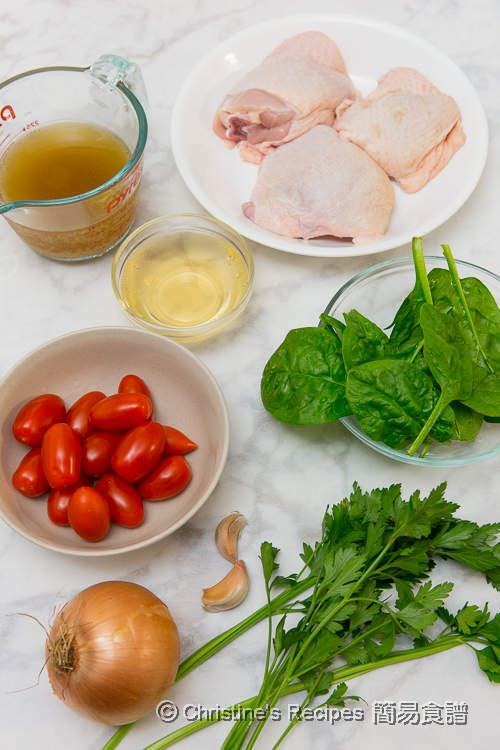 While cooking chicken thighs in stock, it’s better to spoon the hot stock over the chicken occasionally so that the meat will keep moist. Or you may like to cook with cover. You may use any favourite vegetables instead. Cherry tomato is highly recommended as its natural sweetness goes perfectly with the sauce taking the whole dish up a level. I love the creaminess, colour and flavours!